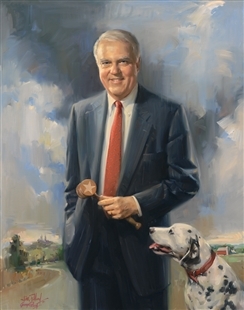 One of James Sensenbrenner’s two committee Chairman portraits by George Pollard, the Judiciary Committee rendition was unveiled on September 18, 2002. Smiling and relaxed, Sensenbrenner is posed casually, sitting on the edge of a desk, holding a sheaf of papers. 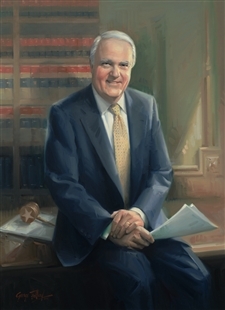 The shelves full of law books and gavel behind him represent the nature of the committee and his position. The gavel with an inlaid star on its head—a gift from his wife—also appears in his Science and Technology Committee Chairman portrait.